The large IRONWORKS industrial construction site is full of activity as it changes and grows into a new hub in East Vancouver’s Port Town. One of Vancouver’s newest, modern, mixed-used developments, IRONWORKS will be home to new, growing and established businesses that need office space, industrial and warehouse space. Construction is now in full swing at Ironworks with the hustle and bustle of people, trucks and equipment. To an outsider, the activity may seem chaotic, though it is anything but. The site is run with precision and great attention to detail, and all activity is thoroughly organized. A strong on-site project manager must have the ability to not only manage a large number of people and equipment, but also constantly assess each situation and adapt quickly to any changes from field reviews and on-site coordination to keep progressing forward. We recently discussed on-site activity with Tony Zanetti, Site Superintendent, to get some insight into what it’s like orchestrating the daily activities of a busy commercial real estate development in Vancouver. Question – Tell me a little bit about yourself, Tony. Tony Zanetti (TZ) – I was born and raised in Italy, 50 miles north of Venice in a place called Treviso. We moved to Canada in 1970. After graduating from BCIT, I got into carpentry, eventually becoming a Project Superintendent. I then spent 32 years as a Construction Superintendent. My wife and I have one son who is attending Trinity Western University in his last year of Business School. Question – You are employed by Ventana Construction Corporation, can you tell me a bit about Ventana? TZ: Ventana offers a wide range of construction services, including development management, general contracting, construction management, design build/design assist and public/private partnerships. Our focus is on multi-unit residential, commercial, light industrial, recreational, institutional and municipal construction projects, many of which have green building components. Ventana started in 1953, when Fred Bond partnered with James Leitch in Edmonton, Alberta to start Bond and Leitch Ltd. Construction Company. After 20 years, Fred’s son, Jim Bond, took over as company president in 1972. Jim and his family moved to Vancouver, BC in 1987 and the company was established in its new home as BSC Construction Corporation, with Jim carrying on as president. 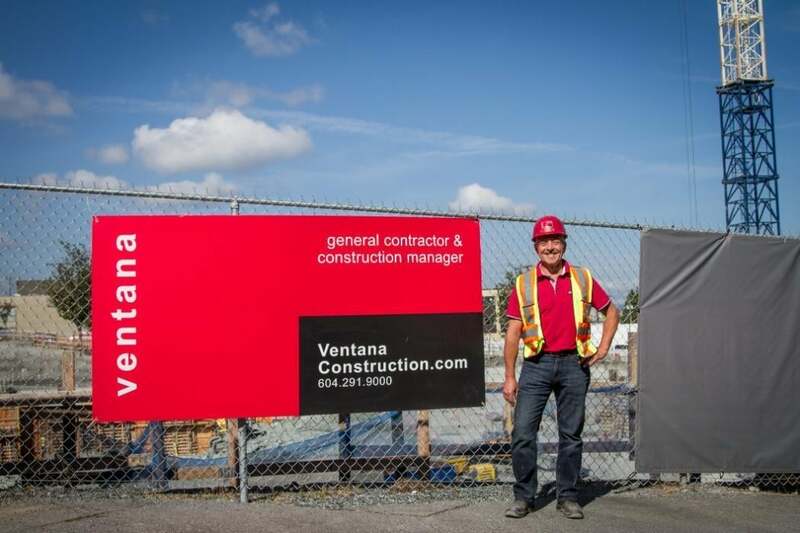 BSC continued to operate in Vancouver for the next decade until it was re-branded as Ventana Construction Corporation in 1997. Today, there are more than 150 Ventana employees at our head office in Burnaby and at our 15 to 20 current construction sites. Question – What is your job on the IRONWORKS site and what are your responsibilities? TZ: I am the Site Superintendent and am in charge of the day-to-day operations on site. I manage the schedule for all of the trades and suppliers. I set up the schedule on a monthly basis, but IRONWORKS is a very complex build, so things change constantly, and we have to be flexible. I am also responsible for ordering all supplies and managing all of the trades on site. Question – Tell me about your experience with Ventana. TZ: April is my 21st Anniversary with Ventana. I was hired in 1997 as a Construction Superintendent and evolved with the company working my way up to Site Superintendent. Question – Can you share a bit about your experience working on large developments? TZ: I have lots of experience with very large developments. I worked on the Langley Event Centre, the Mosaic Place in Moose Jaw, the Westerleigh in West Vancouver and several towers. Most, if not all, of my experience is in structured steel and precast rather than wood frame. The IRONWORKS development fits right in with my experience and comfort level. Question – How does this site differ from other sites you have supervised? TZ: There are several similarities, but there are some specific things that make this a bit different and an easier build. We have easy access for our machinery all around the site – there are no buildings or barriers in our way. It helps that the IRONWORKS construction site is surrounded by other industrial and commercial real estate developments rather than residential. Our daily operations are also fairly smooth as we have storage on site and easy access for our daily deliveries. Question – What do you love most about your job and the IRONWORKS project? TZ: There are many things I love about my job. I love the people. There is a real sense of teamwork on site – everyone is in this together. I also really like the challenge. Things change every day and it really keeps the job interesting. I can’t wait to see the final completed IRONWORKS project. Question – Can you describe what is happening on site right now? TZ: We are starting the structural steel phase on the northwest section of the Pandora building. This means that we have completed the first phase of installing concrete precast walls and are beginning to put the steel beams into place. We are simultaneously beginning the concrete precast wall installation on the northeast section of the building. Question – How long will this stage of construction take? TZ: At this time of year, this process will take about 5 to 6 weeks, a bit longer than normal (typically about 4 weeks). Question – What types of machines are needed on site during this process? TZ: We have large cranes and cement pumps on site as well as a constant train of large trucks delivering daily supplies. Question – How many people are currently working on site? TZ: About 55 – 60 people, on average, right now. On a busy day, we have at least 70. Once the interior work begins we will have up to 120 people on site at one time. Question – What makes construction at IRONWORKS different/challenging? TZ: The weather is a big challenge. This type of development is completely out in the open so it’s vulnerable to weather changes. Large tower developments have more of the structure under cover, so weather isn’t as much of an issue. Also, because the development is using precast concrete that is formed off site, there are several components that need to be scheduled to make things run smoothly. That can be difficult sometimes. Another challenge is that the design is always evolving. We need to be ready for changes and react nimbly. Thanks Tony! It was great learning more about you and what you do. Why Lease when You Can Buy Commercial Real Estate in Vancouver? If you’ve been searching for industrial, office or warehouse space and have been considering an investment in commercial property in Vancouver, rather than leasing, we invite you to book a viewing of IRONWORKS. You’ll see why so many up-and-coming, as well as established businesses, are moving into Conwest’s newest East Vancouver development. All materials, measurements, sizes, specifications and layouts are displayed for illustrative purposes only. This information may be subject to change at any time without notice.